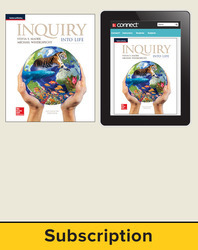 Inquiry Into Life student bundle includes student print edition along with 6-year access to Connect®, SmartBook® adaptive eBook, LearnSmart Labs, and a downloadable eBook. Sylvia S. Mader has authored several nationally recognized biology texts published by McGraw-Hill. Educated at Bryn Mawr College, Harvard University, Tufts University, and Nova Southeastern University, she holds degrees in both Biology and Education. Over the years she has taught at University of Massachusetts, Lowell; Massachusetts Bay Community College; Suffolk University; and Nathan Mayhew Seminars. Her ability to reach out to science-shy students led to the writing of her first text, Inquiry into Life, which is now in its fifteenth edition. Highly acclaimed for her crisp and entertaining writing style, her books have become models for others who write in the field of biology. Michael Windelspecht has taught introductory biology, genetics, and human genetics in the online, traditional, and hybrid formats at community colleges, universities, and military institutions. Educated at Michigan State University and the University of South Florida, he is currently an adjunct professor of biology at Appalachian State University. He served for over a decade as the Introductory Biology Coordinator at Appalachian State University, a program that enrolled over 4,500 students annually. As an author and editor, Dr. Windelspecht has published over 20 reference textbooks and multiple print and online lab manuals and has founded several science communication companies, including Ricochet Creative Productions, which develops and assesses new technologies for the science classroom. Learn more about Dr. Windelspecht at www.michaelwindelspecht.com.